With Quakecon bustling and hustling, John Carmack making sure to bamboozle everyone in a fifty foot radius with his knowledge of coding and graphical engines, Bethesda have made sure that those of us on the outside get at least a little something that we understand; they’ve announced an anthology of almost every Elder Scrolls game they’ve ever made. 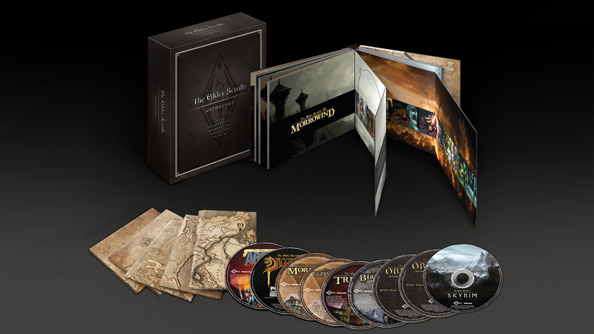 The box is going to come with a whole bunch of genuine, paper, physical maps of five different regions of The Elder Scrolls world (Tamriel, Lliac Bay, Morrowind, Cyrodiil and Skyrim), along with discs containing all the greatest hits from The Elder Scrolls past. So Battlespire and Redguard are missing, but they were always pretty much spinoffs rather than major games, so we’ll excuse the omission. The anthology is coming out on September 10th, and is going to carry a $79.99 price tag.